Speeding boaters on the canals, loud partying at Beach Accesses 1 and 2, and dogs on the beach at North Shell Road were among the issues Siesta Key Association (SKA) members raised when Sgt. 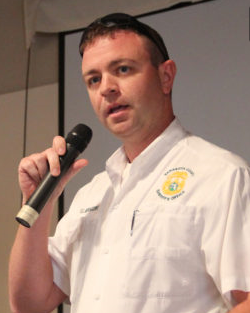 Jason Mruczek, leader of the Sarasota County Sheriff’s Office substation on the Key, stood at the podium during the SKA’s regular meeting in April. Overall, he told the approximately 45 people present, “I feel like it’s been a little slower” than last year in terms of the number of people on the beach. Sheriff’s Office personnel have encountered “no real major problems,” Mruczek said. The parking issue “has been a little bit better, too,” than in prior years. After the February SKA meeting, members voiced their frustrations regarding young people gathering at Beach Access 2 in the evenings and staying into the night, playing music at high volumes and being generally disruptive to the residents who live in the vicinity, on Avenida Messina and Beach Road. “So we’re down there a lot,” Mruczek pointed out during the April 5 SKA meeting. 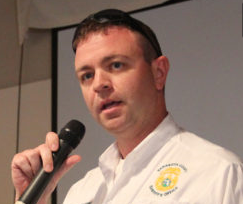 “Evening time is usually the biggest problem down there,” he pointed out, with officers having to deal with traffic congestion, underage drinking and people taking glass bottles onto the beach, which is a violation of a county ordinance. One woman who lives near Beach Access 2 thanked Mruczek for getting the handicapped parking sign erected again after it had ended up in the portable toilet on the 10 Beach Road property that Mike Cosentino owns. The woman then told Mruczek that two other signs — red reflectors that are used to warn drivers not to go out on the beach — are missing from Access 2. “It’s a more complex project that we’re dealing with,” Mruczek acknowledged without elaborating. 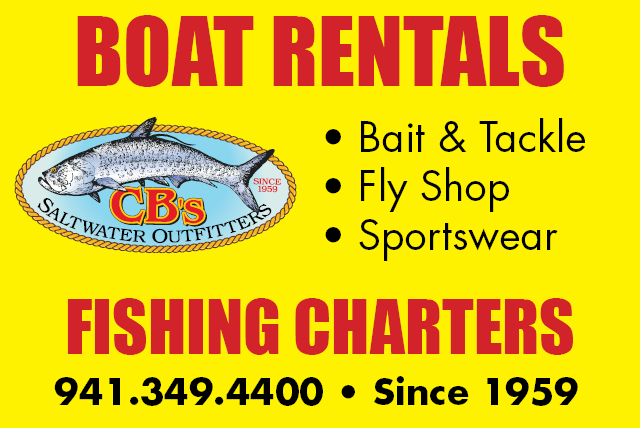 As for the boating issues: Dave Thomas, who lives on one of Siesta’s many canals, explained, “There are a lot of boats that are exceeding normal, commonsense speed limits on the Grand Canal” and other bodies of water in the area. “Because there’s so much residential [development on the canals],” Thomas added, “it’s a safety issue,” with the speeding vessels posing dangers to people and wildlife. The wakes from the boats can damage property, too, he noted. It also is difficult to be heard over the sound of the engines, he added. “Police presence there would be very helpful,” Thomas added, especially between 5 and 7:30 p.m., which has proven to be the worst time for speeding boaters. In times past, Thomas said, the county was able to use a vacant lot on the canal as the site for placement of an electronic sign that advised boaters to maintain a slow speed. That property has a new building on it, he said; nonetheless, one of a couple of vacant parcels in the area might work as a new location for a temporary sign. Mruczek promised to talk with the captain of the Sheriff’s Office Marine Patrol about extra enforcement on the canals and about the signage. “Anything’s better than nothing,” Thomas replied. Another woman brought up the issues regarding North Shell Road, where Beach Access 1 is located. People have turned that area into a “dog beach,” she told Mruczek, adding that the previous morning, she witnessed two dogs relieving themselves on the shoreline. That occurred around 7 a.m., she added. Parking has also “gotten out of hand at night,” she continued. Mruczek told her he would talk with the supervisors of the evening and night shifts for the Sheriff’s Office on the Key. Deputies had been enforcing the closing of the beach access to parking at 9 p.m., he pointed out, even though anyone can walk on the beach after that hour. The county’s parks ordinance does not permit dogs on the beach in any location, except service animals, Mruczek explained. The dogs she has been seeing are not service animals, she assured Mruczek. “They’re not on a leash,” she added, and the owners just let the animals run freely. Deputies do drive up and down North Shell Road regularly, said the man seated next to the woman, but they typically do not walk out on the beach and observe the activities there. As for the parking at that beach access: The woman noted that when deputies used to hand out $20 tickets, people would laugh at them. Now that the deputies are writing $75 tickets for parking violations, she continued, at least people are more responsive to the threat that they will be fined. The couple declined to identify themselves, citing the concern about repercussions from their complaints to Mruczek. Then Bob Miller, the SKA’s treasurer, reported that two more “No Parking” signs had been erected on the county right of way adjacent to the Siesta Estates neighborhood — across from St. Boniface Episcopal Church, where the SKA meetings are held. Still, he said, people continue to park on that right of way. Recently, he continued, he called the Sheriff’s Office because of the number of vehicles there, even though the drivers could donate $10 to St. Boniface and leave the vehicles all day in the church parking lot. When he called and spoke with a dispatcher a second time the same day, Miller said, the dispatcher told him that a deputy was ticketing vehicles parked illegally all the way up at St. Michael the Archangel Catholic Church on Midnight Pass Road. “They had two more officers come out,” he noted, who helped write tickets. Based on the number of vehicles he saw in the county right of way that day, Miller added, he estimated the deputies must have written at least 70 tickets. As mentioned from Sgt. Mruczek’s comments about the number of visitors on the Key the first week of April to Michael Shay, manager of the Siesta Key Village Maintenance Corp., who supervises the upkeep of the Village for the property owners. Shay confirmed Mruczek’s observation, pointing out that he had a good foundation for his view: the amount of garbage being collected. Boro Building and Property Maintenance won that custodial contract last November and began work on Dec. 10, 2017. After years of contracting with one firm to handle both the custodial and landscaping work in the Village, county staff felt more firms would be interested in bidding on the work if it were divided. On April 9, when this reporter saw Shay at the Siesta Key Breeze anniversary celebration, he pointed out that the number of visitors has remained high. “We had an extra [garbage] pickup scheduled for today,” he said. A Waste Management representative told him that a truck would be in the Village early that morning, Shay continued. “They didn’t get here till 11 a.m.” Therefore, Shay had to dump 60 bags of garbage into the Village dumpster.